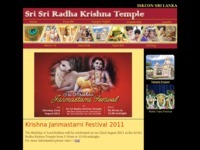 The official website of Sri Sri Radha Krishna Temple in Sri Lanka. The website presents complete information about the activities of the Hare Krishna movement in Sri Lanka. Category Sri Lanka June 13, 2012 by ISKCON Desire Tree.